Queen brings a new Nicki Minaj character: the regal, haughty monarch, a woman who insists on sword-sharpened rhymes as a prerogative for excellence. Why See BET Experience - Friday (Nicki Minaj, Lil Wayne, Tory Lanez, Trippie Redd)? Friday night's revelries feature a quadruple-threat line up of headliners you simply won't want to miss. Bringing fire and sass, lady boss and hip hop mogul Nicki Minaj takes to the stage alongside '6 Foot 7 Foot' hitmaker Lil Wayne, rising Canadian rapper/singer songwriter Tory Lanez, trap mumblecore upstart Trippie Red and ferocious Philly rapper Bri Steves. Rising through the ranks to take her place in the upper echelons of the industry, Trinidadian-American rapping icon Minaj introduced the mainstream to her off-the-wall personas, fast-flow style and neon penchant for bold wigs and costumes with the release of her debut, certified triple platinum studio album Pink Friday. Three albums and millions in records sales later, the Queen of Rap justified her claim to the throne with her fourth platinum album Queen, released in the summer of 2018. Sound good to you? 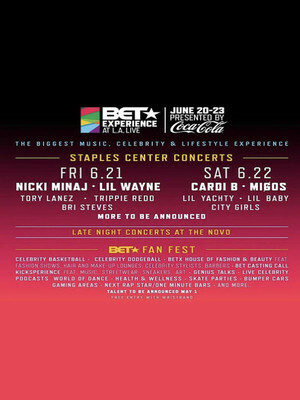 Share this page on social media and let your friends know about BET Experience - Friday (Nicki Minaj, Lil Wayne, Tory Lanez, Trippie Redd) at Staples Center. Please note: The term Staples Center and/or BET Experience - Friday (Nicki Minaj, Lil Wayne, Tory Lanez, Trippie Redd) as well as all associated graphics, logos, and/or other trademarks, tradenames or copyrights are the property of the Staples Center and/or BET Experience - Friday (Nicki Minaj, Lil Wayne, Tory Lanez, Trippie Redd) and are used herein for factual descriptive purposes only. We are in no way associated with or authorized by the Staples Center and/or BET Experience - Friday (Nicki Minaj, Lil Wayne, Tory Lanez, Trippie Redd) and neither that entity nor any of its affiliates have licensed or endorsed us to sell tickets, goods and or services in conjunction with their events.